extremist views. He is a person who does not like do anything by halves and would ensure that his will is done. …analysts are undecided whether his eccentricities mask the cunning mind of a master manipulator or betray an irrational madman. His hand does show cunning (shape of his Mercury and Apollo fingers) and also a need for fame. But Kim’s irrationality is not due to his inability to think. His mind is not an unintelligent mind. Any hand which shows a despotism and greed, needs the self-control to contain it, but neither his Headline nor thumb show that. Although Kim's Headline shows above average intelligence, it cannot control and channelize his brute force, aggression or temper. His thumb is average, lacking the strength and effectiveness to make good use of the mind. It also reveals that when his emotions are aroused (which is almost always) he is unreasonable and stubborn. Status symbols, comfort and luxury are what he craves for. His hand also reveals a fairly simplistic nature. He is the kind of person who is likely to think in black and white. What makes his personality more complicated is idealism. Kim is eloquent as well and has the ability to manipulate people's emotions and beliefs and get across his ideals to the people. But unreasonable force and ideals do not make a good combination and in some ways it reminds me of Adolf Hitler’s hand. People like these always make a song and dance about their beliefs and ideals, but they don’t really care how they go about achieving their so-called ideals, which are mostly selfish in nature. Note: Kim Jong il heads North Korea and is referred to as the "Supreme Leader." When emotions are aroused, all of us become unreasonable and stubborn! I guess the thing here is, how many of us are able to control our emotions... Don't know much about this person, so can't comment. I think it depends how strong the emotions are. Some people feel less strongly, and it is easier for them to control. Anonymous, I am happy that you enjoy reading the blog and I think it's great if it made you look carefully at your lines. 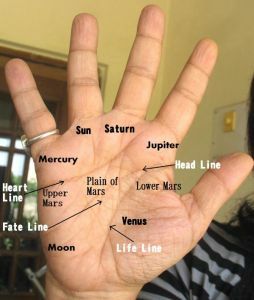 However, I think it's best not to try and analyse the hand yourself, as recognizing lines for they are is not possible unless you are a palmist. In fact even palmists should avoid looking at their own hands, as one tends to become biased! And no, a long fate line does not necessarily mean success. People without fate lines can be very successful. And while the length of any line matters, what is more important is where it starts, where it ends, the quality of the line, the signs on it, and whether it is actually the line or whether it is a chance line.